We don’t have a garden this year, but that doesn’t mean our kitchen counters are not covered with zucchini. Luckily, we have neighbors and friends who happily share. I love zucchini and always welcome it with open arms. Over the weekend, I put the zucchini to good use by baking cookies. Don’t act surprised, you had to see that one coming. You know I am obsessed with cookies! I’ve made zucchini cookies before, but not chocolate zucchini cookies. 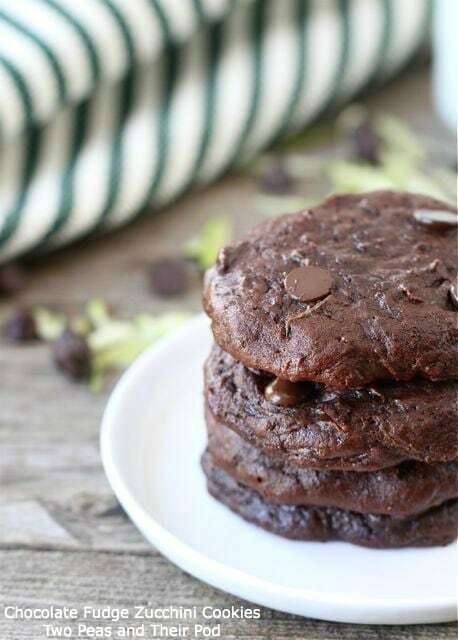 Chocolate lovers turn on your ovens because these Chocolate Fudge Zucchini Cookies are terrific with a capitol T! Now, if you are thinking zucchini shouldn’t belong in a cookie, think again. The zucchini is hidden by the rich chocolate flavor. These cookies are super fudgy-they remind me of a decadent brownie, but in cookie form. The cookies are soft and moist with a cake like texture-thanks to the zucchini and Greek yogurt. Yep, I added Greek yogurt to the cookies, again, you won’t be able to tell it’s there! The Dutch process cocoa and chocolate chips give these cookies an intense chocolate flavor. You will be begging for a glass of milk…and another cookie! 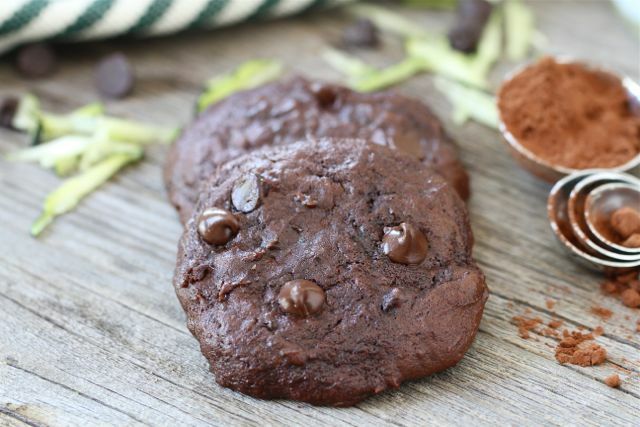 Don’t let your zucchini go to waste, whip up a batch of Chocolate Fudge Zucchini Cookies! If you are looking for other zucchini recipes, check out these 35 Zucchini Recipes. Lots of ideas to help you use up that garden zucchini! 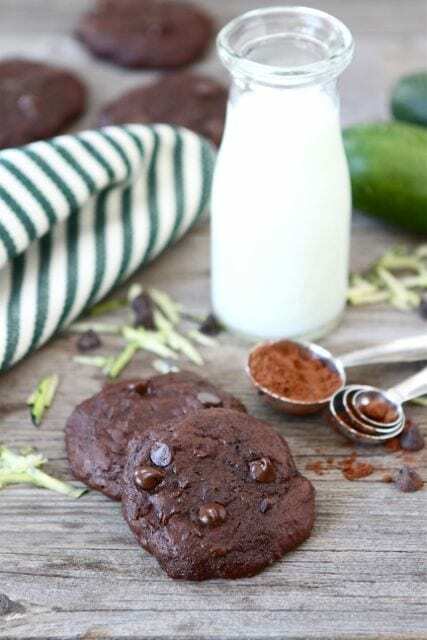 These Chocolate Fudge Zucchini Cookies are a great way to use up your garden zucchini! 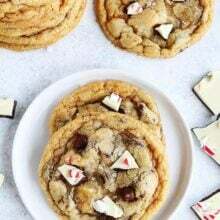 Chocolate fans will love these cookies! Preheat oven to 350°. Line a large baking sheet with a Silpat baking mat or parchment paper and set aside. In a medium bowl, whisk together flour, baking soda, and salt; set aside. Melt butter in a large saucepan over medium heat. Remove from heat; stir in cocoa powder and sugars. The mixture will be thick and resemble sand-that's ok. Add the yogurt and vanilla extract. Stir until smooth. Add flour mixture, stirring until moist. Stir in zucchini and chocolate chips. Drop by level tablespoons 2 inches apart onto prepared baking sheets. Bake for 10 minutes or until almost set. Cool on baking sheet for 2-3 minutes or until cookies are firm. Remove cookies from sheet and cool completely on wire racks. Note-I squeeze the shredded zucchini in a paper towel and pat dry to remove the excess water before using. These look fabulous and I can not wait to try them. On a side note I wanted to mention an ad I saw on another food site. The ad was for Cookies for Cody which is a fundraiser for a very sick 4 year old boy in Texas. The fundraiser is currently going on and looks like an easy way to help out. Just thought you and your readers might like the opportunity to check it out. Thanks so much for your wonderful recipes and I have to let you know I LOVE your cookbook. Oh, those look so irresistible! Great texture. I imagine the zucchini makes these cookies super moist. My garden is per run with zucchini and it seems that something sweet needs to be baked soon. Zucchini is such a wonderful, versatile, SNEAKY ingredient! These look so chewy and awesome! Yum! Best use of veggies ever!!! Oh these look so fudgey and chocolatey!!! Wow! I happen to have a zucchini’s in the kitchen… I may have to whip these up! now these are super creative and so fudgy looking! Wow, those look so delicious! I wonder if they’d work with gluten free baking mix. Oh my gosh I have to make these cookies, they look wonderful!!! 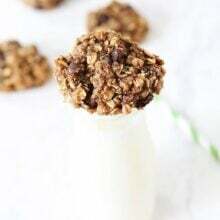 I love that these are a little lighter than a typical cookie but look amazing! I was just thinking how I needed a zucchini cookie in my life! see these look so good, and sound like they are healthy with veggies in them, win win! These look so yummy and fudgy…I would have never guessed they had veggies in them!! I think I need to make these. I never thought I would think that about anything that involves zucchini! These look delicious, and I will be adding this to my list of cookies to make! Wow, the last time I combined courgette and greek yoghurt was in tzatsiki! But these look like a much better use, yum yum! Oh I want one or a few for breakfast. I love how fudge they look! These look to die for, Maria! Need to try them! I love the hidden yogurt and zucchini in these, adding veggies to dessert is SO sneaky but a great way to eat my greens. And chocolate just makes everything better! Oh wow, I’ve made zucchini cookies too but not the chocolate kind. What a great idea, especially with the chips in there….LOVE! Wow, these look amazing. I really really can’t believe there’s zucchini in there…I trust you so I’m going to have to try these soon!! yummy!! i love chocolate and zucchini together. they look so rich and fudgy and like they’d be perfect with that cold glass of milk! These look perfectly tender and gooey, Maria. What a great way to use all of that summertime zucchini! am bookmarking this- yum ! Can I sub the Greek yogurt with something else? I just made your chocolate zucchini cupcakes. They were delicous! Holy God will you feed me? I can’t help it- I am a wee bit envious that there is no zucchini in Seattle yet! It has been so dang cold here it just hasn’t grown yet! But I am marking this one for sure- these look so rich and delicious! I might actually make these today! I have zucchini and need to make dessert for a picnic tomorrow! These sounds so fudgey and delicious! mmmm, they sound so rich and chocolaty! 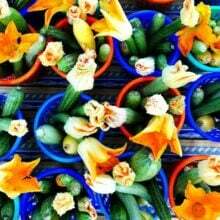 I have a bag of zucchini I need to use up, I might have to use that as an excuse to make these! It’s definitely time for great zucchini baked goods. I love the Greek Yogurt in these! There are no eggs in the recipe. Whoa, wait. Brownie in cookie form, full of healthy zucchini shreds? AND chocolate chips? YUM! Great idea, Maria! These look way to chocolaty to have zucchini in them! I might be able to get my husband to eat zucchini this way! This seemed like a crazy idea when I read the post title but now I feel like you’ve convinced me – from your description I guess it gives them a moisture like beetroot does in cake. Wonderful, I told you about my kids and vegetables right? This should be a must in my kitchen, but I guess I will try to peel the zucchini, just to try to have as less as green as possible. I really need to try baking with zucchini. I think I’ll start with this chocoholic-friendly recipe! Love how you’ve made healthy cookies. The little ones won’t even be able to tell!! Thanks! loving these Maria! Miss you and your awesome family! What a delicious way to use up all that zucchini! I love incorporating zucchini in as many recipes as possible. Thanks for this inspiration! I love that these are super fudgy. So if thy have zucchini in them, then they are breakfast appropriate right? Yes and yes!!! 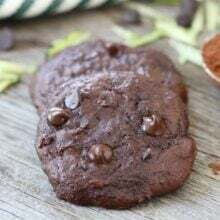 I love zucchini cookies and adding chocolate just takes it over the top!!! I’ll take 5 for now and 30 for later please 😉 ok I guess I’ll bake them myself!!! wow! I’m not a big fan of zucchini, but the flavours would be overpowered by the chocolate. you had me at fudgy 🙂 and it’s an extra treat to have veggies in it too! What an interesting ingredient list and technique! I can’t wait to use some of my extra zucchini and yogurt in these! After seeing this recipe yesterday, I visited my parents’ house and when my dad showed me all his freshly grown zucchini (they’re all the size of my bicep! CRAZY big! ), I knew I had to make these cookies! They were so delicious! My parents didn’t have any yogurt on hand, so I used one egg and they were still great! love how fudgy these look!! fabulous creation! Wow! These look amazing! I love baking with zucchini. Chocolate and zucchini loaf is one of my favourites. 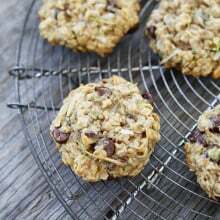 Oooh love the idea of adding zucchini to cookies! Made these today (substituting sour cream for the yogurt since that was what we had), and WOW! My non-vegetable eating 6 & 3 YO sons loved them (and, er, me too)! Moist & full of chocolate goodness. Thanks so much! I’ve been enjoying so many of your recipes since I found you 3 weeks ago! this is a perfect way to get in my veggies! I have not baked with zucchini. (gasp!) These cookies look delicious enough to give it a try, though!! Made these on Monday to take to my sister-in-law. I was in a no-sugar challenge that day so I took them to my sister-in-law without even trying them. That is sort of against my personal rules, but I know your recipes are tasty so I didn’t feel it was too great of a risk! Tried them Tuesday. NUMMY! Thanks for the recipe! Maria, these are beautiful and I love that they’re “trickster” desserts, studded with yummy zucchini for picky eaters 🙂 yum! I love it that you’re obsessed with cookies!!! You’re my kind of gal! Ibhabe a zucchini overage also! Better bookmark this! I’ve never had zucchini cookies before but these look heavenly!! Cant wait to try them! Just made these cookies and they’re incredible. Mine weren’t quite as pretty as yours – I could still see some tiny bits of zucchini poking out of the tops of mine, but boy were they delicious. Soft, moist and fudgy. I’ll definitely make these again. It’s a great way to use up extra zucchini and it’s a sneaky way to get a few more veggies into my kids. Thanks for sharing the recipe. These cookies look fabulous! I love how thick and fudgy they look. Another great way to use up some of my zucchini! I would love to try these. What is dutch-process cocoa? I’ve seen this listed in other recipes and haven’t seen a product with that description in my grocery store. Any help and/or product names for this ingredient would be very helpful. This recipe is soooo good! Thank you! I doubled the recipe and used 8 T. butter and 2 T. mashed avocado. I also used 1/2 c. mini morsels (so they would melt right in) and 1/2 c regular choc chips. I then baked some cookies and spread some in a 8″ square pan and made brownies. These are actually incredible. They taste like two-bite brownies but better. I just made them for the second time in the last few weeks and they always disappear in no time. Thank you for sharing! These cookies are amazing. I have made them twice now and my family loves them. I originally tried the recipe because we had 6lbs of zucchini, and my husband was tired of it stuffed and sauteed. Now I making them just because! Thanks for sharing 🙂 Also – this is an easy recipe to double, and the cookies turn out just fine. Thanks so much for posting this. Zucchini (when used) ROCKS!!!!! I am most recently discovering my love for baking and cooking… I love your website! My question is…. I thought you are not able to use a Dutch process cocoa with recipes that call for baking soda..? I used Hershey’s unsweetened natural cocoa and the cookies were great! The only difference was they were domed shaped! Do you have any insight? Thanks for your expertise! Pingback: BROOKE’S FIRST STEP and food. Of course. These look amazing and inspired me to make a vegan version which was delicious (http://sthingmissing.blogspot.co.uk/2013/08/vegan-chocolate-courgette-zucchini.html) thankyou so much for sharing a great recipe. Since all the other recipes I have tried from your site were so good, I decided to look through your cookie recipes….and came up this recipe just in time…as my garden is overflowing with zucchini. Totally different way to make cookies but they are so good…just like brownies. I have made them twice now, and always double the recipe. I use my large OXO scoop, which I think is about 2 Tbsp? and get 24 large cookies. I increase the baking time by about 4 to 5 minutes and they turn our perfectly. Thx for yet another great recipe. A friend made these and used during a fund raiser for our church. Loved so much had to make a donation for a second plate and THEN ask for the recipe!! I substituted vanilla yogurt for the plain yogurt and left out the vanilla extract. Very good! I ran out of cocoa powder so instead I used 1/4 cup of cocoa and 1/4 melted chocolate chips worked out great! My daughters and I just made these yesterday. I just love how soft and fudgy they turned out, and that the batter didn’t even require a mixer to put together, either. Great recipe, and thank you! Thank you for this recipe! My whole family loves it. We make it vegan by using Earth Balance “butter” and coconut milk yogurt (& vegan chocolate chips) and they are so delicious!